We don't really get fresh peas in Florida. I knew that. So I needed to grow them if I wanted them. I knew that, too. Well, I knew I had to try. 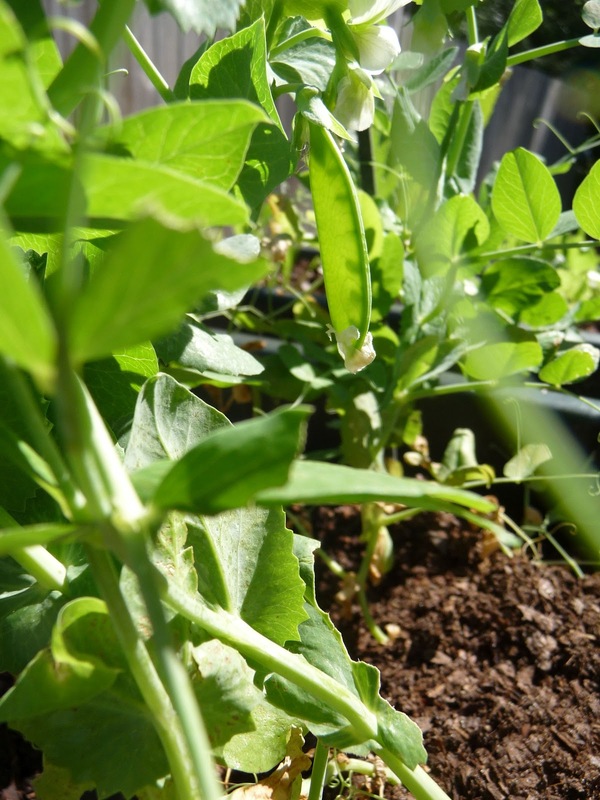 Peas were one of the first things I tried to grow when I started this project. It was too late in the year to get peas in Florida. Truth is, it never really is early enough to grow peas in Florida. They like mild temperatures, much like I do, and Florida doesn't really have those. Ever. Well, OK, a few days a year, but not long enough for the peas. Or me. But for the purposes of this dish, the peas. 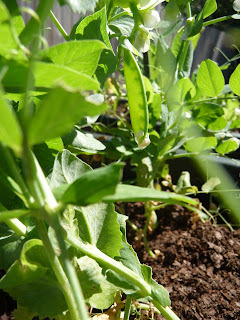 I tried again in the fall, and I got … some peas? A few. They were viable, there just weren't a lot of them. So I cheated. I used frozen peas to make the flan and I used my peas for the garnish. 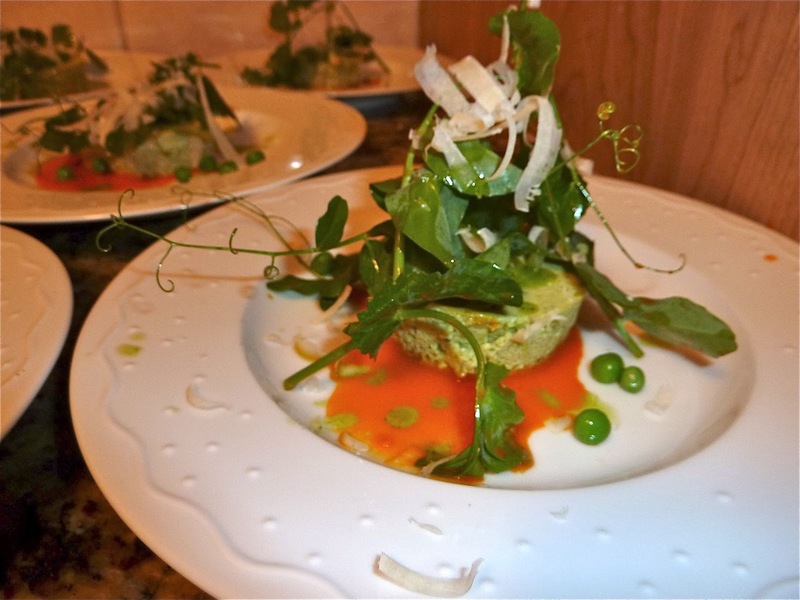 Mainly I needed to grow the peas for this dish because it required pea tendrils as a sort of salad on top. I knew I had zero chance of getting tendrils. The vinaigrette for this is made with carrot juice. So it's peas and carrots. Genius. 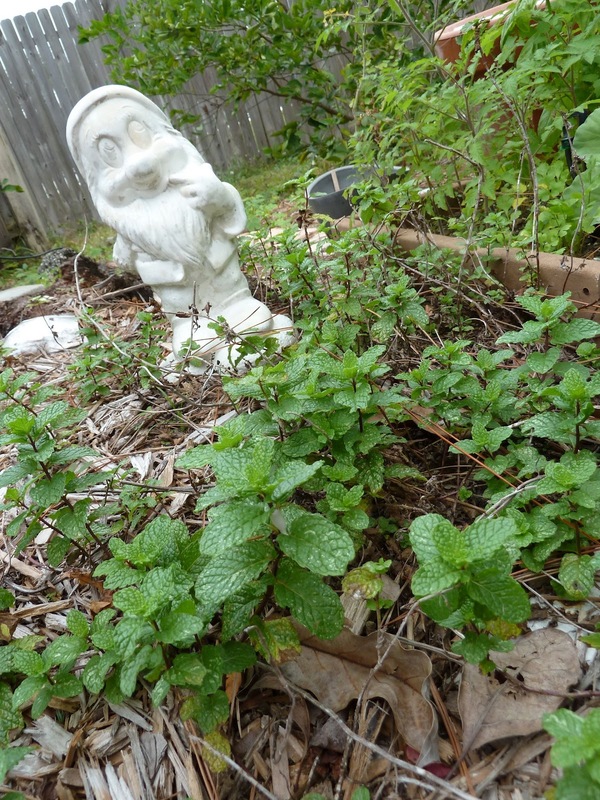 Mint is the dominant flavor. I grew that, too. 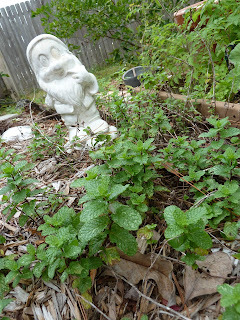 Mint is pretty easy to grow. When we sold the house, it was all over the backyard. Hope the new owners like mint. The case could have been made that this should have been the first dish I made for the blog. It might have been the impetus behind the whole project. 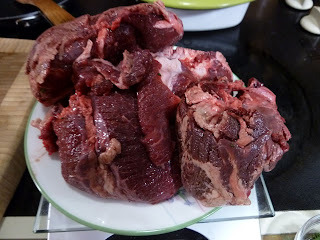 As much as the underlying theme behind most of the dishes is, "well, I couldn't find (some ingredient), so I went to (some unreasonable end to acquire it), with this one, I had a three-pound bag of beef cheeks sitting in my freezer. They had been there since I did a story several months early -- and by "several," I mean, probably, ummmm, 24? -- where I needed them to make beef cheek pierogi from Michael Symon's book. Back then, I finally found them at Master Purveyors, a place in a warehouse district of Tampa that sells to restaurants. 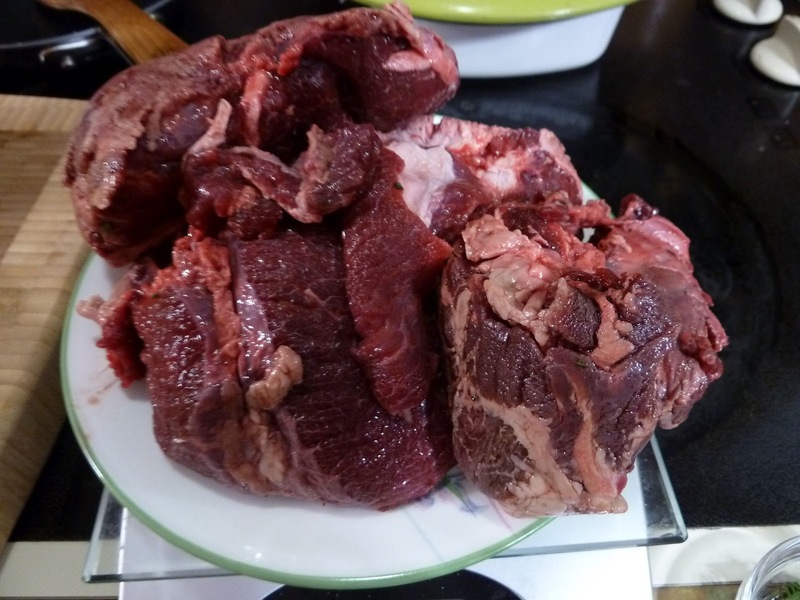 To get the two pounds of beef cheeks I needed for that recipe, I had to buy an 18-pound box of them. Inside were 6 three-pound cryovac bricks of beef cheeks. I got some of my favorite culinary cohorts to go in with me, and they took most of them off my hands, did their own things and left me with two packs. One went into the pierogi, the other went into the freezer. I looked at the recipe. Squab liver sauce? Really? Two sticks of butter? Well, yum, but are you sure? Black truffles? Riiiiiiiiiiiight. So I put the book away. But I didn't stop wanting to make it. I was, in fact, going to make this the first thing that I made from the book. But one thing got in my way: Truffles. I started cooking for this project last January, before I knew where I was getting some of the stuff I would need. 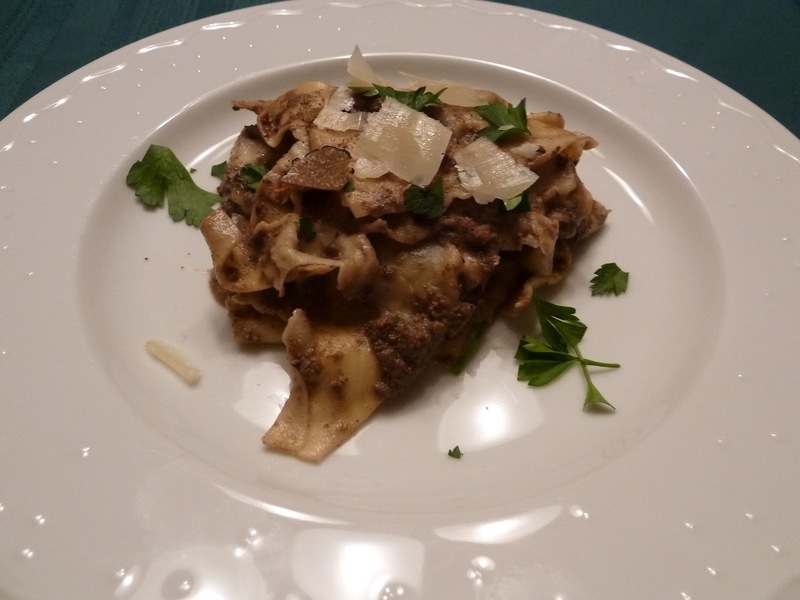 By the time I found Culinary Classics in Orlando, which I found had a lot of the crazy stuff I needed for these recipes and others that I've done lately, black winter truffles were no longer in season. Summer black truffles are cheaper, but I'm a snob, so I figured there was a reason for that, and decided to wait for the winter truffles. But on an afternoon excursion to Orlando, I stopped in to say hi to the people at Culinary Classics, who I suspect think I'm insane for some of the crazy e-mails I fire off to them at 2 a.m. ("I see you have mangalitsa pork belly on sale; How much is kurobuta? Where does the wagyu hanger steak you have come from?) They knew I was coming and offered me a tour, and if there was armed security, it was stealth. While we were in the walk-in cooler, gawking at a sheet tray full of foie gras, I noticed a plastic container full of rice. I knew it wasn't just rice in there. Turns out there were two containers of rice. One for white truffles and one for black. The white one was empty, except for the intoxicating aroma whatever was in there had left. I asked if i could buy the rice. My guide, Dave Adby, thought I was kidding, or maybe it was just nervous laughter. Then he opened up the other container, with the black truffles, and there were about a dozen of them nestled into the rice. They're sort of like mushrooms, only more awesome, and more expensive. They were each a little smaller than a golf ball. At different times of the year, black truffles can cost almost anything. At Culinary Classics, I've seen the price fluctuate from about $25 an ounce to almost $100. The day I was there, they were $26 an ounce, and the two that I bought totaled a little less than 1.5 ounces. This is why you don't find them at Publix. In the TV clip, Mario talked about squab livers. In the book, it said that you won't be able to find squab livers, and should just make the sauce with chicken livers. Pffft, I thought. I can find anything. I'll find squab livers and do it right. The first place I found that I thought might have them was the Squab Producers of California. So I e-mailed them and asked if I could buy livers. "We don't sell just the livers. If you want livers, you'll have to buy the whole bird." This was an intriguing suggestion. There is a squab recipe in the book. Maybe I could kill two birds … wait, no, maybe I could avoid killing two birds for two dishes. So to speak. I looked at the squab recipe. I'd need four squab. I needed a pound of squab liver. I suspected the math would not work for me. "How much does a squab liver weigh?" I asked. "Maybe three-quarters of an ounce." 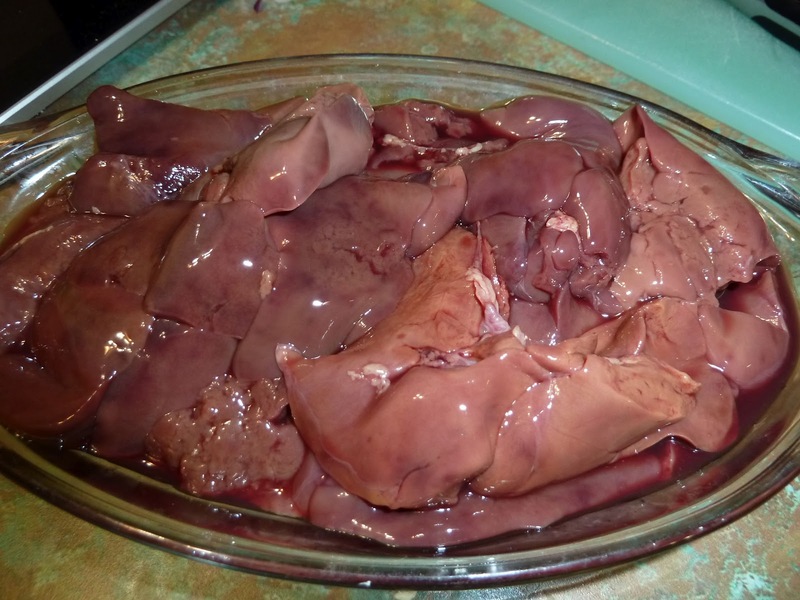 So, I would need more than 20 squab to get a pound of livers. And I really wanted two pounds of livers, to do another recipe in the book. I found another place in California -- apparently squab are a big deal in California -- but I could never figure out if they really existed, or wanted to sell to me, or how much they might charge. So I did the logical thing, and did what the cookbook said. Chicken livers are at every supermarket I've ever been in. One potential problem I was left with was truffle slicing. Truffles have their own tool so you can slice them really thin. I've never had a truffle, so I've never had a truffle slicer. 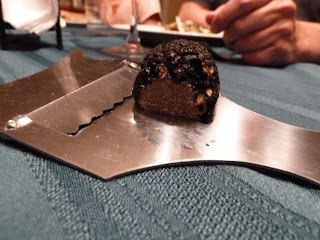 I told my pal Domenica Macchia that (she's a chef), and she told me she had two, and I could have the one that Daniel Boulud didn't give her (it is seen above, with the remnants of a truffle). That was fair. I looked in my kitchen for something I had two of so I could reciprocate, and all I could find was gnocchi boards. So I gave Dom the one that Laura Reiley didn't give me. Totally fair. So my ravioli were kind of rough. They weren't beautiful. Some of them broke open in the cooking process. They wouldn't have made the cut at the restaurant, I feel confident. But they were pretty good. The filling was meaty and tender, and the sauce was butter with a little funk from the liver. I'll take it. I have a new kitchen, in a new city, with new purveyors and new opportunities. 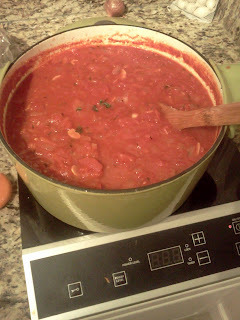 So I have a pot of basic tomato sauce (page 220) on the burner and I'm ready to get cooking again. I left Florida in January, and I had about a dozen dishes that I hadn't posted yet. I knew it was going to be at least several weeks before I started cooking regularly again -- turns out a few months -- and I figured that I could just post those things in the interim. What I didn't count on was it taking so long to find a new place and get settled. And to get Internet. Sheesh, Comcast makes it virtually impossible to become their customer. Anyway, the next several posts will be mostly cleaning up the Florida dishes, but there will no doubt be some current ones thrown in as I get cooking in the shadow of the Washington Monument. Being in D.C., I feel confident that there will be fewer sourcing issues. And I don't know how much I'm going to be able to grow, even with my swank 13th-floor, south-and-east-facing balcony. We'll see. And yes, this tomato sauce became delicious pucks of awesome in the freezer, just like the previous batches.